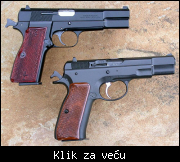 Češki Pištolj CZ-75 i njegove modifikacije. MyCity Military » Pešadijsko naoružanje, municija i oprema » Češki Pištolj CZ-75 i njegove modifikacije. Prošlo je podosta vremena od kada je prikazan sada več Legendarni CZ-75 u kalibru 9x19 mm parabelum 1975 godine na sajmu naoružanja u Madridu. Od tada pa do danas našao se u mnogim armijama sveta kao formacijski pištolj.U policiji službama bezbednosti i obezbeđenja.Premda je i njegovu slavu uvečala i karijera kao sportskog pištolja bez koga nema ni jednog značajnog takmičenja u svetu.Što samo potvrđuje kvalitet samog oružija a i inventivnost samih Čeha kao starih majstora oružarstva i tradicije koje imaju kroz istoriju.Na šta bi se i mogli ugledati oni koji rade u Kragujevačkoj Zastavi fabrici namenskog oružija.A ne da od dva derivata rade CZ-99 što i u stvari jeste kopija Švajcarskog SIG-P226 i Nemačkog Waltera P-88.Umesto da urade originalni proizvod večito kopiranje što sa licencom što bez nje. U prilogu deo sa Wikipedije sa baznim modelom i varijantama modifikacijama nastale od njega. The original CZ 75, easily identified by the heavily-stepped slide and short slide rails. Late version, easily identified by longer slide rails and shorter slide-step. Second-generation CZ 75 with internal firing pin safety, squared and serrated trigger guard, and ring hammer. A variant of the now-common CZ 75B (B standing for firing pin Block) with a decocker replacing the traditional manual safety. (D stands for Decocker). This variant is quickly becoming the most common of the CZ 75B models, due to the additional safety the decocker safety provides. Variant of the CZ 75 BD equipped with loaded chamber indicator, reversible magazine catch, lanyard ring, checkered front and back strap of the grip and serrated trigger as standard. Most POLICE models have "POLICE" stamped on the slide. A smaller amount exclude "POLICE" but have front slide serrations. Stainless steel version of the CZ 75 B. Available in a high gloss and matte stainless finish. Also available in the New/Limited Edition (sand blasted finish with sides of the slide and frame decoratively ground). All stainless models feature ambidextrous safeties. A version of the CZ 75B with a factory-reworked trigger group. It is available chambered for 9 mm or .40 S&W. An updated version of the CZ 75 that's also ambidextrous. A CZ 85 with a firing pin block. A CZ 85 B with a decocking lever, instead of a safety. A limited production compact CZ 85 with under-barrel accessory rail and chambered in .40 S&W. Identical to the current CZ 75 compact in .40 S&W. adds an adjustable rear sight, extended magazine release, drop-free magazine and overtravel adjustment on the trigger. Lacks a firing pin safety so that firing pins can be replaced without special fitting. A standard CZ 75 with a slightly shortened grip and 3.9-inch barrel. There is now a version available chambered for the .40 S&W. Combines the frame, grip and capacity of the full size CZ 75 with the shortened (by 20mm) barrel and slide of the CZ 75 Compact. Very compact - similar to the P-01 in size, but lacks an M3 rail frame and features a smaller muzzle point and snag free sights. A popular choice for a carry weapon, known for its inherent accuracy and weight distribution. 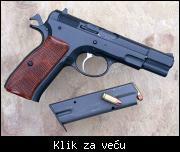 A CZ 75 which has a single-action trigger mechanism and a drop-free magazine. It is available chambered for 9 mm or .40 S&W. 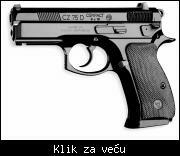 A CZ 75 that has a longer and heavier, constant trigger pull (double-action only). Chambered for 9mm and .40 S&W. Featuring no external safety or decocker. As well as a bobbed hammer. This model is no longer in production. A CZ 75 Compact variant intended for law enforcement use, with an aluminum alloy frame, decocker and under-barrel accessory rail. 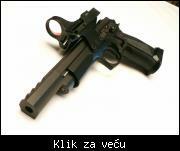 It is the new weapon of choice for the Czech National Police since 2001. It received NATO certification after undergoing extensive testing. Its NATO Stock Number (NSN) is 1005-16-000-8619. The CZ P-07 DUTY is a compact, polymer-framed CZ 75 variant notable for having a redesigned trigger mechanism. The redesign has reduced the number of parts as well as improved the trigger pull. The exterior restyling was greatly influenced by the SPHINX 3000 design (itself being an enhanced Swiss CZ 75 clone). Chambered in 9mm Luger and .40 S&W, the CZ P-07 DUTY also includes the ability to change the manual safety to a decocking lever and vice versa through an exchange of parts. Similar to the P-01 with accessory rail, but with all-steel construction and utilizing the full-size frame and slide as well as incorporating extended-capacity 18-round magazines. It is available with an ambidextrous manual safety (SP-01) or with an ambidextrous decocker (SP-01 Tactical). Used in the 2005 IPSC World Shoot XIV by World Champions Adam Tyc and Angus Hobdell (1st and 3rd place respectively in the production division). New generation of CZ 75 SP-01 pistol especially adapted according to suggestions as proposed by users from Law Enforcement, Military and Police communities worldwide, with an additional input from the Team CZ shooters Angus Hobdell and Adam Tyc. Based on the SP-01, it has no firing pin block resulting in improved trigger travel. It also features a slightly reshaped grip and safety, a “weaker” recoil spring for easier loading, and fiber optic front sight and tactical “Novak style” rear sight. 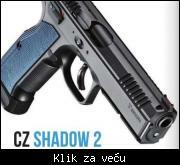 CZ 75 SP-01 Shadow Line - a competition-centric variant of the CZ-75 model. The CZ 75 Phantom has a polymer frame, is 33% lighter than steel frame models, with accessory rail and a forged steel slide with a weight saving scalloped profile. Two Interchangeable grip rear strap inserts are included with the Phantom to accommodate users with different sized hands. The pistol is further outfitted with a decocking lever. A CZ 75 variant designed specifically for IPSC competition with extended grip, single-action trigger, heavy-duty free-falling magazines, and an enlarged magazine well. A competition version designed for Open Division IPSC competition, with three port compensator, adjustable trigger, extended magazine release, ambidextrous safeties, fully adjustable sights and two-tone finish, with blued slide and satin nickel frame. Czech Army Paratroopers of the 4th Rapid Deployment Brigade are fully equipped with this pistol from this January (2012). A CZ 75 variant designed specifically for IPSC competition with extended grip, single-action trigger, heavy-duty free-falling magazines, and an enlarged magazine well. Replacing the ST IPSC was the Tactical Sports model, which featured minor improvements over its very similar predecessor. Available in 9×19mm (20 rounds) or .40 S&W (17 rounds). A competition version designed for Open Division IPSC competition, with three port compensator, adjustable trigger, extended magazine release, ambidextrous safeties, fully adjustable sights and two-tone finish, with blued slide and satin nickel frame. A competition variant based on the Tactical Sports model, equipped with a compensator and electronic red-dot sight on a frame mount. Designed especially for IPSC Open Division (and replacing the older Champion model), the Czechmate presents a turnkey solution for the sport, offering a complete competitive package including additional magazines and spare parts. The CZ 2075 RAMI subcompact variant designed for concealed carry. A subcompact version of the CZ 75 intended for concealed carry. Features a 3-inch barrel, aluminum frame and low-profile sights. Available in 9×19mm or .40 S&W, with standard magazine capacities of 10 (9×19mm) and 8 (.40 S&W) rounds, respectively. An optional 14-round magazine is available for the 9 mm version. Same as the 2075 RAMI but includes a decocker and tritium sights. A .22 LR caliber slide/ barrel assembly and magazine kit to fit onto most standard CZ 75B frames (except the Tactical Sport and SP-01 Phantom). The Kadet also used to be sold as a complete pistol (slide assembly and frame), but is now only sold as a slide assembly to be mounted on existing frames. The 2nd generation conversion kit currently being sold is called the "Kadet 2", and includes a dedicated .22 slide stop that locks the slide back on an empty magazine. Night sights are optional. A selective-fire variant introduced in 1992 intended for law enforcement and military use. One distinguishing characteristic of earlier models is its longer compensated barrel although later models may have a standard barrel. An extra magazine can be attached to the front to act as a makeshift foregrip. Одговор је веома једноставан шта је Застава из Крагујевца урадила оригинално од пешадијског наоружања до данас.Наводим оригинално не копију већ оригинал. Automate M49 i M56, RB M49 i M57. snajperke M69, M76* i M93. *Da jeste sistem AK, ali za tu namenu je prilicno originalna. ###Automate M49 i M56, RB M49 i M57. 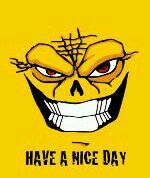 snajperke M69, M76* i M93."" pa nezznam, ovaj automat M 56 mnogi u stranjskim zemljama smatraju jednostavnim klonom Šmajsera? boki1970 ::Одговор је веома једноставан шта је Застава из Крагујевца урадила оригинално од пешадијског наоружања до данас.Наводим оригинално не копију већ оригинал. A ima toga jos ako te konkretna konstrukcija bas zanima (BTW, ni braca Koucki nisu otkrila "toplu vodu" sa modelom ČZ-75 koji je u sustini vrlo uspela kompilacija razlicitih resenja sa drugih modela poput SIG P-210, Browning HP-35, Walther PP itd...). M56 je klon smajsera mozda u manjoj mjeri nego sta je CZ 75 klon Browinga HP. 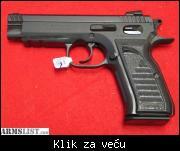 Da l' je moguce da na forumu vec ne postoji tema o CZ-75? Konstrukciono je mnogo blizi Beretti nego MP-40. Jedino zajednicko sa MP-40 je sklopiv kundak i oblik rukohvata. 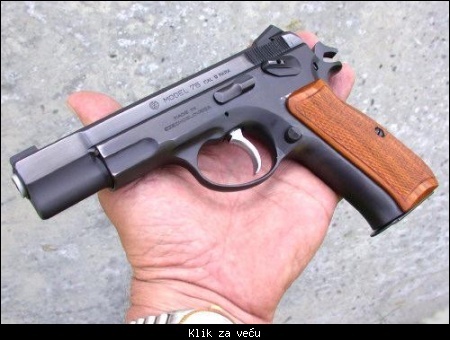 duxhm ::Da l' je moguce da na forumu vec ne postoji tema o CZ-75?